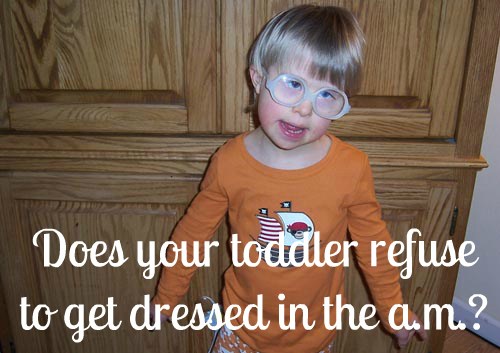 Does your toddler refuse to get dressed in the morning? When I want my 2 1/2-year-old to get dressed in the morning so we can leave the house, she does not care much and runs around the house and doesn't listen to me. I fixed her trays with clothes to wear and I try to encourage to get dressed herself. What is the Montessori Method of getting my child to comply? Children at this young age have a hard time with transitions, and getting out of your pajamas and into your clothes for the day is a transition. So do it first thing in the morning upon waking. And have your child get dressed in the bathroom. That way, she can go potty before she puts on her clothes, clothes that you set out for her in trays, but put the tray in the bathroom. And there's no room to run around in the bathroom, or toys and books to distract her, typically. 1) Once you make this change in your routine stick to it and do not change it (unless your child is sick and stays in bed). Having a regular daily routine for children ages two to four has a calming effect on them. 2) Make sure your child gets up and out of bed at the same time each morning. 3) Make sure she goes straight into the bathroom to potty and get dressed. 4) She cannot eat or watch any TV or play with her toys until she gets dressed. 5) Getting dressed will always come first in her morning routing, always. It will take few days for your child to get used to this change. So tell her the day before, then tell her at bedtime: "Tomorrow when you wake up we are going to go potty and then get dressed." Then, in the morning, remind her as soon as she's awake. Also, the day or night before, let your child help you pick out which clothes to wear the next day so she can be a part of the process. Let her help you put them in the bathroom, too. Lastly, if your child still refuses, to get dressed ask if she needs help, and sing a get-dressed song, just make one up and then sing it with her! Singing is a great way to help young children get through transitions. You may also be interested in my affordable Montessori and homeschool PDFs and programs for birth to nine-year olds at Montessori for the Earth.